All theatres have their ghosts – the lingering spectres of actors, directors, and stage hands are forever engraved in the boards of the stage they once walked. They hide out in the wings, and play in the shadows of the spotlights. We feel them holding their breath alongside us during dramatic scenes, and catch their whispered laughter in moments of lightness. They brush against us in a sudden draft after the lights go down, appear in the flickering specks of theatre dust, are heard in the hiccup of a sound cue and observed in the inexplicable shifting of a set piece. But what if we could spend an intimate evening with one of them? What stories would they share? Barrymore’s Ghost offers us a rare glimpse into the life of one such spirit – Hollywood icon John Barrymore. 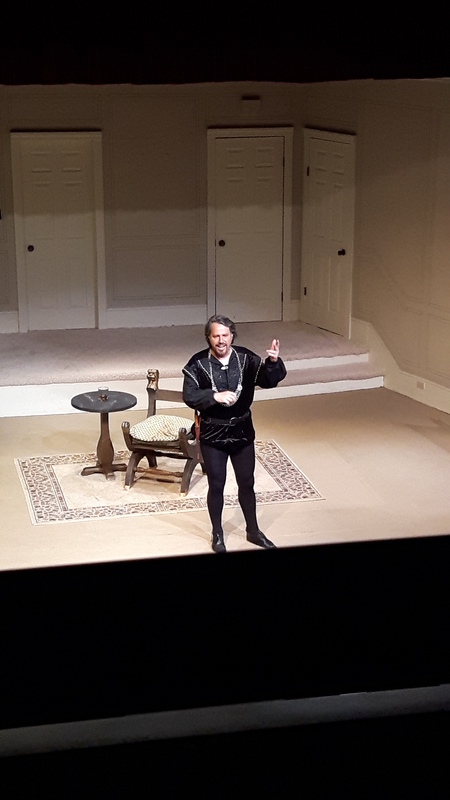 Barrymore’s Ghost comes to life through actor John Cousins in a collaboration with The Page Theatre Company and White Rock Players Club at the Coast Capital Theatre. Barrymore haunts the stage of his own life, taking the audience back in time to witness the glamorous, ridiculous and tumultuous life of “Hollyweird”. He spins us through a whirlwind of love affairs, theatrical success and ultimately, his own personal failures. Barrymore takes us on a journey into the reluctant frenzy of his success in the roaring twenties, and then, with thoughtless abandon, leaves us bleeding on the roadside of his own despair. It is a wild ride of dreams, fears, insecurities, and arrogance. A creative life is a lonely life – his disdain for Hollywood is exhibited in a complicated mess of appreciation and ingratitude. A one man show is a delicate challenge – the actor must be engaging enough to pull the audience into his fictional world. John Cousins does this successfully with the help of the simple splendour of costumes by Pat McClean, a clean lighting plot by Richard Smith, and sound design by Colleen Bignell that gracefully melts into the flat set that Cousins transforms in each moment. Cousin’s draws us into the lamentation of a life lost under the shadows of a rusty spotlight. He lures us into the highs and lows of Barrymore’s theatrical life, taking us with him into the frustration of fighting for his most coveted role – that of an ordinary life. Cousin’s performance is as bumpy as it is smooth. It’s not flawless – but then neither is the man he portrays. In order to believe him, we need to see the gaffes and missteps, the moments of uncertainty, the few indistinct words that eagerly spill from his mouth. Cousin’s is so relaxed in his personae that the slip-ups we see are not an actor’s mistakes, but John Barrymore’s. Barrymore’s ghost revisits the arrogance, insecurity, drama, tragedy, wit and humour of a Hollywood icon. Artistic Director, Alexandra Wilson, wanted to introduce a new generation to the glorious (and intriguing) past of the Golden Age of Hollywood. The Page Theatre and director Dale Kelly effectively transport us back to a moment in time that will never be replicated. Barrymore’s Ghost only has a few days left before he evaporates back into the ethereal dust of the theatre. “Though this be madness, yet there is method in’t.” (William Shakespeare, Hamlet). Barrymore’s Ghost is on now at the Coast Capitol Theatre, Running July 13-23rd. Tickets at: www.whiterockplayers.ca Phone: 604-536-7535. In Person: 1532 Johnson Road, 1-5:30 pm.